In the early Spring of 1799, James Atkinson, an enterprising young gentleman from the wilds of Cumberland, set forth by carriage for the glorious city of London. In his suit pocket were recipes for fine scents and toiletries of his own devising. Next to him sat a sizable quantity of rose-scented bear grease balm. Next to the balm sat a growl-y bear. The growl-y bear was thoroughly devoted to James. Within mere days the utterly fantastic balm became indispensable to London's most uppity crust, who braved the bear at the door of 44 Gerrard Street ("that marvellous perfume shop with the most terrifying bear") to procure sufficient stock for the Social Season. I can do without snobbery and the highest echelons of society, but I do love an animal story (whether it's true or not). Since we're in high-summer mode, I thought I'd grab a couple of "bouquets" to review this week. The British Bouquet goes on smelling of, no, not flowers, but medicine: rubbing alcohol, (high-end) antibacterial wipes, and an orange-flavored "pill" scent that reminds me of Bayer Children's Chewable Aspirin; these head notes quickly become watery, light and airy and are almost undetectable within a few minutes. Then, in mid-development, British Bouquet revs up and turns sweet, with none of the realistic scents of a garden bouquet, British or otherwise; all its notes are "perfume-y" and blended in such a way that I can't tell lavender from myrtle, bitter orange from lemon. I am able to detect a leather scent in the base, but only if I put nose to skin (the leather aroma disappears quickly). As it dries down, The British Bouquet becomes even blander — a too-eager-to-please, mid-market, "department store" floral fragrance; it has so-so sillage and its lasting power is average. The British Bouquet smells decidedly feminine to my nose. The longer you wear them, the more The British Bouquet and The Odd Fellow's Bouquet smell alike; they both wear down to sweet, banal white musk aromas. Frankly, I find the price ($175) of these two perfumes shocking; they don't smell "top notch." After wearing these fragrances for a couple of days, my interest went back to Mr Atkinson's bear. Was the bear a he or a she? Did s/he have a name? Did the bear even exist or was it a marketing fantasy, like the claims these perfumes are bold, stylish and irresistible? Since I've only tried two Atkinsons fragrances, I'm curious if any readers have a favorite from the line...or if one of these perfumes that left me icy cold is beloved by someone. Do comment! Atkinsons The British Bouquet and The Odd Fellow's Bouquet are available in 100 ml Eau de Toilette, £95 or $175. 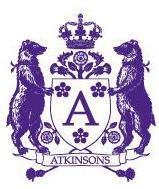 For buying information, see the listing for Atkinsons under Perfume Houses. After such a wonderful story, I was sad that neither one of these scents panned out. I do wonder what that rose-scented bear grease balm smelled like – talk about an animalic rose! jirish: really! bring that product back! HA! Well, if I ever meet a bear in the woods I hope he is as well dressed as the one in the picture! I did hear some good things about the old Atkinsons Lavender, but when I looked at whats available (in UK department stores) there seemed to be only a newer, more complex blend containing lavender and which was MUCH more expensive (read higher echelons, snobbery, etc) and which had garnered much worse reviews. Merlin: lots of good talk about the OLD Atkinsons, but not this new stuff. When I was an EMT I had to go to a nursing home called Odd Fellows once in a while. That’s the first thing I thought of. The second thing was that I don’t want to smell like that place. poodle: ha! 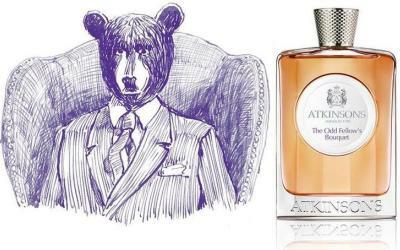 Well, what odder fellow could there be than a bear in human clothing…a missed opportunity for Atkinsons! British Bouquet doesn’t sound like me kind of thing, but I must say the Atkinsons’ coat of arms is adorable. Eek! I would be growl-y too, if I was sitting next to vat of grease made from one of my own kind. kindcrow…you are indeed KIND…I didn’t even think … ya can’t make bear grease without killing the bear. Atkinsons didn’t think this one through! HA! nathan: thanks; that’s good to know. I won’t take any trouble to find samples of the others. Clearly, there is a rose-scented bear grease balm-shaped gap in my collection. I immediately checked ebay and was excited to see charming tins of “Finland’s internationally famous Bear Grease leather dressing.” Unfortunately, it’s been drastically reformulated and is nowadays made with petroleum products. Noz…I too read up on bear fat…especially horrified at the prospect of using it in pastry instead of butter! I’ll never look at bear claws the same way again.